Do you only score a trickle of leads each day? Let's turn that into a flood. Lets' increase your sales without blowing the bank on marketing. This article is a “from the vault post” – I originally wrote it back in March 2014. The site I wrote it for no longer exists, so I’m bringing it back to life on the Local Digital blog. A while back I wrote this post that covered how simple things can have nice results. This was a client that came to us after they had tried migrating their site themselves and lost a substantial amount of traffic in the process. In January of 2014, the site saw a 3.15% increase in SEO traffic when compared to January of 2013. This is a massive turnaround, as it had plunged to depths as low as an 80% decrease in SEO traffic in June 2013, all due to the failed site migration. With that in mind the recovery has clearly been a success, but what did we do to achieve these results, and more importantly, what could the client have done to avoid the losses to begin with? The major issue here was the site owners migrated from an old CMS to a new one and in the process failed to recreate a large number of pages on the new site. 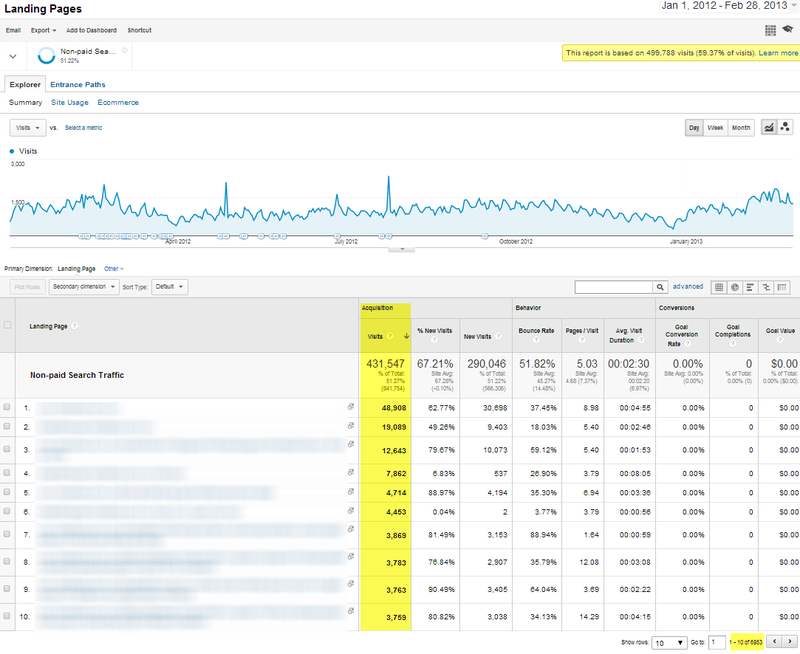 Each one of these pages had been indexed in Google and was bringing in visits here and there. With the pages missing so too was the opportunity for traffic. To give you an idea of what was going on, take a look at these screenshots. The culprit had been identified, but how would you go about fixing this? And more importantly, if you were considering a site migration how could you be certain to migrate over all of the essential pages to the new site? It’s pretty simple. You should first run an SEO landing page report in Google Analytics that covers a decent time period. In this case, we did it from January 1, 2012 right up to the migration date at the end of February 2013. Once the missing pages were recreated, Google crawled them over time, indexed them and the traffic started returning. Due to the large number of pages and the time it took to recreate them on the site, the recovery process in this particular case ended up taking 6 months. So how would you avoid this if you were considering a migration of your own? Run a landing page traffic report as above before migrating your site, and ensure all the relevant pages are ready to go on the new site before sending it live. Also, if you’re changing domain name or URL structure in the process you’ll need to also have a 301 redirect mapping strategy in place…. But that’s a topic for another time. Love dealing with the knowledgeable team at Local Digital. They are always professional and willing to go that extra mile. Thank you! Education and service is very important to me and my business and these guys have been amazing to deal with from day 1. Very helpful, efficient and trustworthy. Thank you for everything you have done to build my brand. Director - Michael Arthur Diamonds 150,000+ follows on social platforms. Local digital have helped us with our website for a few years now. They always respond quickly when we need adjustments to the site. 5 starts from us!! Local Digital built a new website for my company and have been running an excellent SEO campaign for me. They are able to explain complex issues in simple terms, they are easy to communicate with and very responsive if I have any questions for them. Very happy with their services!!! We've worked with the team at Local Digital for a number of years and we've seen considerable growth on our digital platforms. They're responsive, experienced, always happy to provide advice and a pleasure to deal with. Fantastic service! Helped me with an issue, others couldn't fix too. Highly recommended! Absolutely wonderful service. My questions related to Google adwords and SEO were answered, after business hours, via their chat window when most other businesses have turned on their answering machine. Very helpful and knowledgeable. Thank you! Nothing is too much trouble for the guys and we have had great results from our partnership so far. A welcome change as we have had poor experiences in the past. The team at Local Digital have been very helpful in redesigning our website and getting us good quality leads. They really know their stuff, and have boosted our business in a significant way. Couldn't recommend them enough. Working with Local Digital for a couple of years now and they deliver outstanding work. They have control on our AdWords accounts and they are performing great. They are always available for questions and are assisting us with everything if we need help. Great company with awesome people, keep up the good work guys! These guys know their stuff and I would highly recommend if your looking to generate leads and grow your business. Good communication and they stick to thier word. Your Rough Monthly Budget For Advertising?